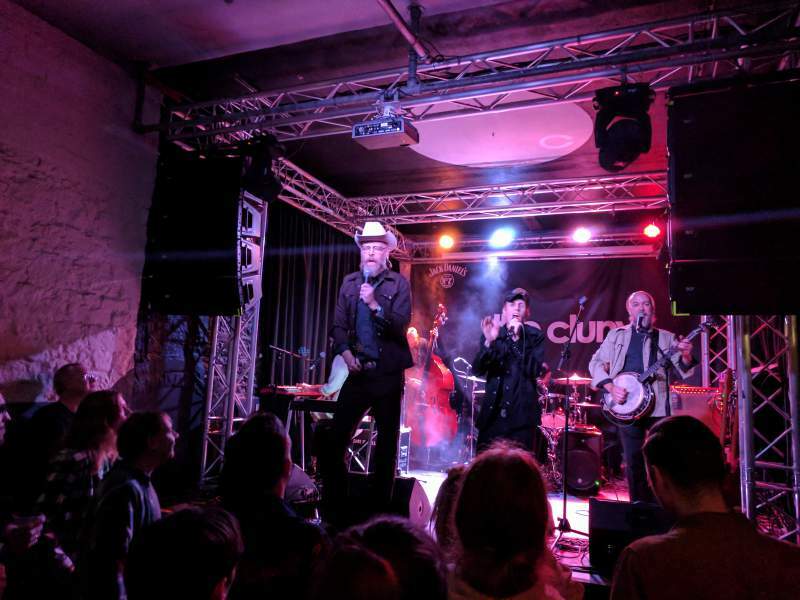 It was an unexpected delight to see Denver’s Slim Cessna’s Auto Club fetch up at The Cluny as part of their first UK tour last year. It was even more unexpected to see them back again. While the crowd wasn’t significantly bigger – and certainly far less than they deserve – it does seems like Newcastle is being won over by the band, and Slim and Munly didn’t seem to need to work quite as hard to get a reaction. As with last year’s gig, the set leaned heavily on the recent The Commandents According To SCAC album so it saw the band at the darker, rockier end of things, and in the ensuing year those songs have been honed into gnarly, powerful beasts that fit nicely between obligatory renditions of This Is How We Do Things In The Country and Americadio. As ever, the interplay between Slim and Munly is intriguing and amusing and faintly arousing, replete with ominous testifying and all manner of on and offstage shenanigans. Rebecca Vera is really cementing her place in the band too, her musical and percussive contributions accenting things beautifully while her voice is a thing of wonder, and perhaps needs to be heard more. The closing, demonic doo-wop rendition of Commandment Three is up there with any band’s finest moment (although Vera and Dwight Pentacost seemed to be fighting back giggles throughout) and as before, the band swerve any demands for an encore by placing Slim front and centre to deliver a showstopping karaoke version of tearjerkin’ war horse For The Good Times as the rest of the band pack up around him.